In my previous article, I reviewed the trend of deregulation and liberalization of the utility sector and explained that transactions that used to be self-contained internally are now being externalized, that customers’ DERs (Distributed Energy Resources) are being utilized for grid management upon increase in variable renewable energy such as solar PV and wind, and that platforms are being developed to realize the new concept of peer-to-peer (P2P) energy trading. In this article, I will discuss how blockchain technology and ICO (Initial Coin Offering) can be utilized for democratization of energy infrastructure. Power generation plants, positioned on the upstream of energy infrastructure, used to be large scale, centralized, and built by state-run corporations or corporations with large capital. However, building power generation plants has become much less difficult because of cost reduction of solar PV and wind power technology in the past decade. A small-scale plant can be built on the rooftop of a house, unused land, or in a factory. Energy is being decentralized, and a foundation is being built for the democratization of infrastructure. In Japan, solar PV has been booming since 2012, the year feed-in-tariff (FIT) started until around 2015. “Mega solar, ” megawatt-class (1MW=1,000kW, a 1MW plant can power approx. 200 houses) solar PV plants have been built all over Japan mainly for investment purpose. Solar PV plants of this scale require capital of 100s million yen (millions US dollars), and only corporations that have capitals in addition to capabilities of land procurement and development can built mega solar PV plants. Under the current policy, owners of generation plants receive sales of energy that is funded by “renewable energy generation promotion levy” paid by organizations and households on top of electricity charges. If a owner of generation plants is a corporation with large capital, such as a foreign investment bank, it can be viewed that citizens benefit such corporations. 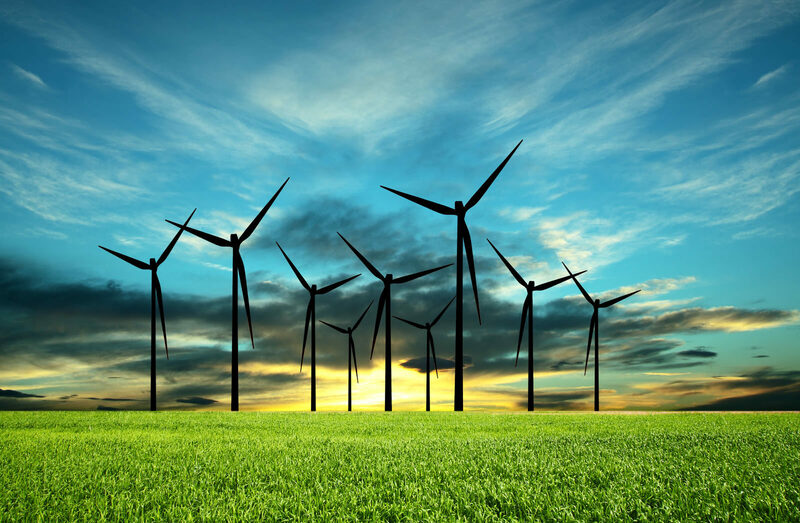 Benefit realized in the area where generation plants are constructed is limited while the owner of generation plants (typically based in metropolitan area or overseas; outside the area of generation plants) have guaranteed income for 20 years. I see cases of opposition by locals against plans of generation plants that involve a construction that destroys local landscape or a significant land formation, on top of the structure of majority of income flowing to the owner with large capital. In this situation, specific organizations with large capital have authority, and we are still halfway on building mechanism for infrastructure democratization. To cope with the situation, there is a growing movement of community-based energy business. One of its concepts is to circulate capital in the area that used to be flown outside the area, thereby contributing to revitalizing the local economy. For example, an estimate shows that 100 billion yen (approx. 1 billion US dollars) is flowing out of Tottori prefecture (population: approx. 560,000) as electricity charge . Capital circulates within the area with a community-based energy business funded and run by municipalities and local companies that hires local people. 31 municipalities started community-based energy business as of August 2017  and 150 are reviewing possibility. Infrastructure funds that distribute profit to investors from owned infrastructure such as solar PV plants are also available though it is not designed for the benefit of communities. Retail investors can invest in funds, as the ownership and right of operation of solar PV plants are securitized and fractionized. Small investment is possible; the minimum unit of such funds is less than 100,000 yen (900 US dollars) as of October 2018. Infrastructure funds comprise ones listed on a market and unlisted ones. Tokyo Stock Exchange Infrastructure Fund Market was created in April 2015 and five funds are listed as of October 2018. Listed funds have liquidity and enable investors buy and sell at any timing. This could be a good tool for democratization of infrastructure if it attracts many investors. We observe cases where blockchain technology is used for financing renewable energy generation plants in different parts of the world. Power Ledger, an energy blockchain startup in Australia announced Asset Germination Event (AGE) in October 2018 to accelerate penetration of renewable energy. This is a mechanism which enables retail investors such as individuals to invest in energy asset, which used to be investment opportunities for organizations with large capital only. Shared ownership becomes possible in this mechanism. Power Ledger already completed ICO, listed POWR token in 2017 and will issue the new AGE token for Asset Germination Event. AGE token will be “security token” that constitutes financial securities and represents part of energy assets. The company intends to meet regulatory requirements of Australia; protection of investors are expected. 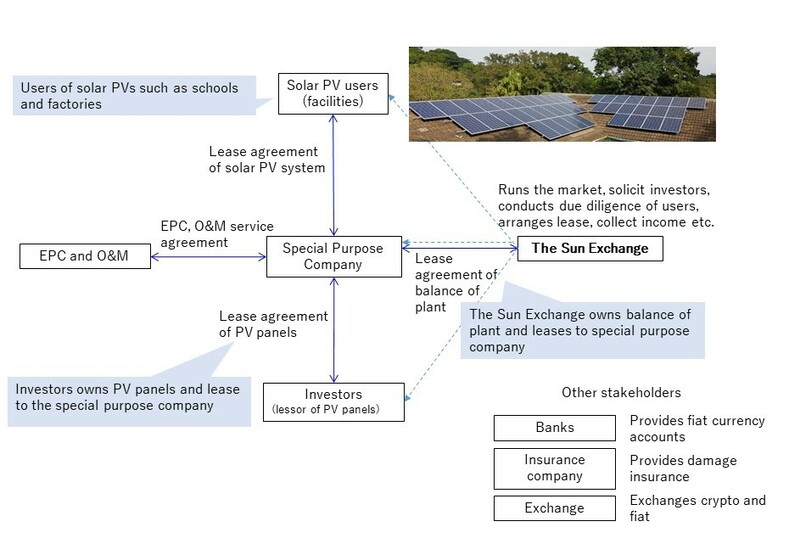 The Sun Exchange, a South African company, has ran financing platform that allows investment via Bitcoin since 2015 and has completed financing five solar PV projects (as of October 2018). Those solar PV plants are up and running. The company seems to specialize in small-scale projects less than one megawatt that corporations with large capital do not prefer. Blockchain technology used in the system enables financing from all over the world and distributing income that is cumbersome if done manually efficiently by smart contract. Can infrastructure investment benefit from characteristics of blockchain technology? Smart contract enables, for example, automatic distribution of income which used to be done manually. By combining digitized payment means, fast payment process can be realized and transaction cost will be lowered. Conventionally, it was difficult to collect a large volume of small capital as cost per transaction was high. Tokenization of assets enables fractionizing assets. Combined with the above 2 automation by smart contract, efficient process is now possible, enabling financing project by many micro-investment. Assets have liquidity if tokenized and traded in a token market. Investors can buy and sell at discretionary timing. As aforementioned, there are already infrastructure funds listed on a market which retail investors can invest in at small amount and also buy and sell at any timing. It is unlikely that the above characteristics of 1-4 of blockchain technology will change the world of infrastructure investment drastically. Blockchain technology may demonstrate its characteristics in the following ways: For one thing, financing an attractive project from all over the world, taking advantage of digital currency being not one nation’s currency. “Attractive” does not always mean high yield. For example, demonstrating unproven technology that has large potential, or a social project such as one that enhances the life of people in developing countries significantly. For another, blockchain may be used as a useful tool for community-based energy system discussed above. By providing ease and convenience, blockchain technology may help build a mechanism that allows more investors to participate. Further, an extended idea is circulation of capital by combining with local currency, but its penetration might be difficult. In any case of above, it is necessary to meet regulatory requirements and deal with investor protection. It is reported that there were many fraudulent ICO projects in the unregulated domain, but new approach for public infrastructure should not be used for fraud or substandard projects.